Over the years, I came across this statistic, again and again, on the Web sites and in the policy documents of the most powerful global development organizations, including the World Bank and United Nations agencies. It is often cited as the key piece of evidence that investing in poor girls and women in Asia, Africa, and Latin America creates a high rate of return. They will supposedly marry later and delay childbearing, and, in doing so, generate economic development, limit population growth, educate their children, improve children’s and women’s health, conserve environmental resources, and control the spread of H.I.V. They will end the so-called cycle of poverty in which individuals, families, communities, and nations get caught. I was first introduced to a version of the statistic a decade ago, when I was a volunteer with the Clinton Global Initiative’s girls and women’s commitment team. During this time, I was a Ph.D. candidate at the University of California at Berkeley, conducting dissertation research on the transnational network of philanthropic and development institutions focussed on girls and women. In the week before the organization’s 2009 meeting, I was introduced to Bill Clinton’s speechwriter by my supervisor. The speechwriter wanted me to draft talking points for Clinton on girls and women’s health, economic empowerment, and education, based on statistics that I had been given by another C.G.I. employee. Under the heading “Why Investing in Girls and Women Works,” I found the following: “When an educated girl earns income she reinvests ninety percent in her family, compared to thirty-five percent for a boy.” The Nike Foundation was listed as its source, but from my research on the foundation I had reason to doubt that. Though the foundation collected data to monitor the grantees it funded around the world, it did not conduct the type of research necessary to produce a statistic that could be generalized to all girls and women around the world. But could the statistic possibly be true? With so many powerful people and institutions citing it, it certainly seemed true. If it were, it would reflect the disproportionate burden that some girls and women bear for the well-being of others. I emphasize “some” because the images of girls and women accompanying the statistic in the policy briefs and program Web sites were never of middle- and upper-class white girls and women from the U.S. or Europe—girls and women like me. The images were always of poor black and brown girls and women from Africa, Asia, and Latin America. Thus, if it were true, the purported social and economic return would reflect gender disparities that are deeply racialized in the global imagination. I began searching for its origin. But my research revealed nothing but a peculiar set of inter-institutional citation practices. The State Department cited the World Bank. The World Economic Forum cited the Nike Foundation. The Nike Foundation didn’t cite any study. Neither did the U.N.’s Food and Agriculture Organization. Melinda Gates has said it again and again, but has never cited a study. In writing this essay, I reached out to some of the institutions using the statistic, as I continued to seek a source. The Nike Foundation spokesperson referred me to a book where she believed the citation was found—a black-and-white book of photography of women around the world, called “Women Empowered: Inspiring Change in the Emerging World.” The citation in the book said “United Nations study,” with no other information. A spokesperson for the Food and Agriculture Organization provided a citation from a 2009 Nike Foundation-funded report by Plan International, which cites a Nike Foundation media document. The F.A.O. spokesperson told me, “Precise figures on this subject do not exist and 90% seems high, especially as there is considerable case-by-case variation by age, family size and composition, type of income and so on.” The World Bank spokesperson said definitively that there was no source, adding, “We work to weed out so-called zombie statistics, suchas this one, from use in our reports as they are not based on facts or data.” The World Bank spokesperson said that it would remove the statistic from its Web site. In the past decade, the quest for Big Data has become all the rage among major development institutions. In 2014, the U.N. called for a “data revolution for sustainable development.” In 2016, the Gates Foundation announced an eighty-million-dollar commitment to “close gender data gaps.” In my recent communication with the World Bank, the spokesperson explained, “One of the biggest barriers to closing gender equality gaps between men and women is the lack of data and evidence that make the case for policymakers to prioritize gender equality.” These institutions herald quantitative approaches to produce the most valid and reliable data, with randomized control trials as the gold standard. Yet the ghost statistic should be a cautionary tale. 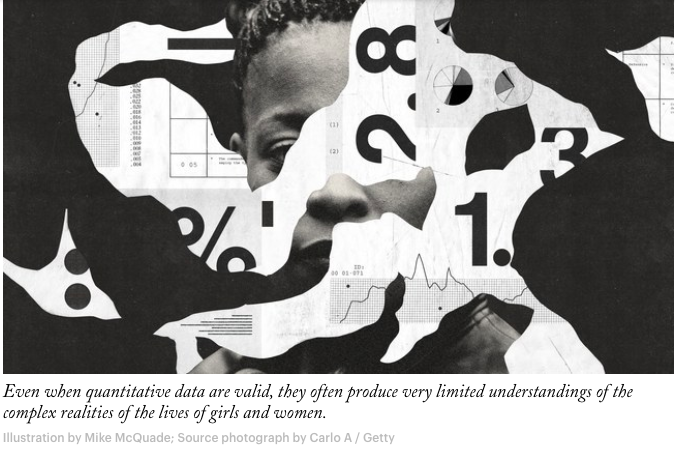 Even when quantitative data are valid, they often produce very limited understandings of the complex realities of girls and women’s lives and the conditions that produce poverty and inequality. These simply cannot be captured by a trial or a survey alone. The Gates Foundation spokesperson, for example, sent me recent studies showing that investing in women is a highly effective development intervention. Among them was Duncan Thomas’s paper demonstrating that, as the spokesperson put it, “maternal income increased family nutrition by 4-7 times more than the income of fathers,” and that “child survival had a highly positive relation to unearned income of mothers, and that the effect is 20 times larger compared to fathers.” Unlike the ghost statistic, these results are reliable. But they don’t simply reveal that “when women have access and control over the household income, they are more likely than men to invest in the health and welfare of their families,” as the spokesperson wrote me. They reveal a shocking depth of gender inequality at the level of the household. The rapid expansion of conditional-cash-transfer and microfinance programs around the world, such as Bolsa Família, in Brazil, and the Nobel Peace Prize-winning Grameen Bank, in Bangladesh, is based on the idea that giving money to women rather than men leads to significantly higher development returns. Yet critical feminist scholars have demonstrated that these programs employ a feminized logic of development that has been shown to shift the burden of development onto poor girls and women, who are expected to solve a laundry list of problems. In her new book, “Unjust Conditions,” Tara Cookson reveals that the conditional-cash-transfer program in Peru had significant “hidden costs” for mothers, who were required to overcome time-wasting barriers to access public services and meet local authorities’ coercive demands. The feminist scholars Ananya Roy and Lamia Karim have similarly demonstrated that popular microfinance programs, such as Grameen Bank, often have adverse effects on the women they intend to serve, including increased debt and domestic violence. For Cookson and Lorena Fuentes, of the feminist research consultancy Ladysmith, “the gender data gap is also qualitative.” Closing it requires engaging with women’s accounts of their own lives and drawing on decades of feminist knowledge about the root causes of poverty and inequality. If we continue creating global-development policies based on the story that women are more likely than men to invest in their families, we will not transform the inequitable gender relations that make these statistics true. We will capitalize on these inequalities—and potentially exacerbate them—for the sake of a development return. As the novelist Chimamanda Ngozi Adichie has warned, this is “the danger of a single story,” which produces homogenized portrayals of people, places, and their possibilities. Kathryn Moeller is the author of “The Gender Effect: Capitalism, Feminism, and the Corporate Politics of Development.” She is a visiting assistant professor at Stanford University’s Graduate School of Education and an assistant professor of educational-policy studies at the University of Wisconsin-Madison.